Japanese curry (カレー) from scratch. Loaded with tender chunks of chicken, carrots and potatoes in a rich savory curry sauce. 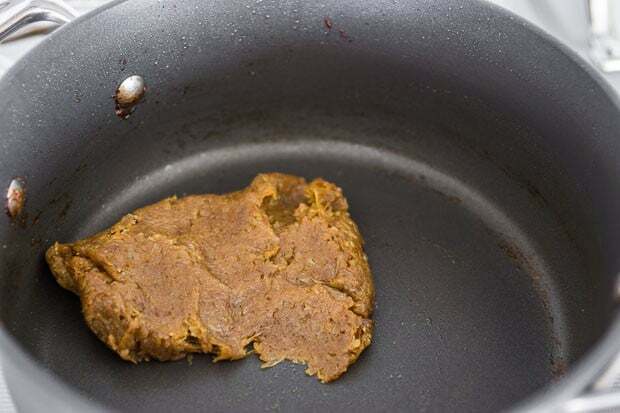 In a country where you can get everything from hamburgers to lady’s undergarments out of a vending machine, it’s no surprise that home cooks have many convenient options when “cooking” a meal. 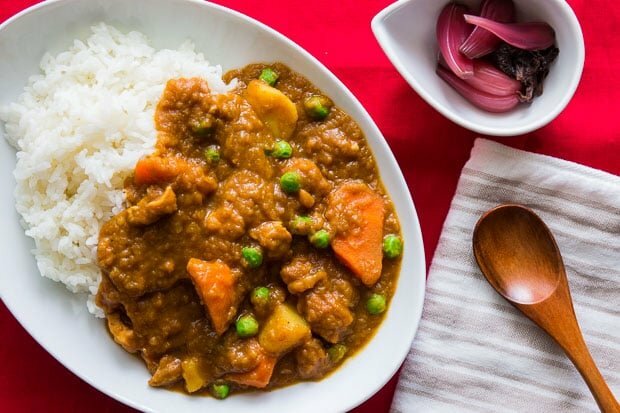 For some dishes like Japanese curry (カレーライス – karei raisu), pre-made mixes have become the norm rather than the exception and a trip to the supermarket will reveal an entire section of boxed curry mixes. These instant curry mixes usually take the form of bricks that look a bit like bulbous chocolate bars and are loaded with saturated fat, MSG and preservatives. But as much as I want to hate this junk food, it’s a comfort food I grew up on and could easily be called the national dish of Japanese home cooking. That’s why I’ve been working on my recipe for Japanese curry from scratch for the past 7 years. It may take a little more effort than using the packaged variety, but it doesn’t require any extra time, and involves only a handful of additional ingredients. So what exactly is Japanese curry? Like many foods in Japan, curry worked its way into the Japanese culinary repertoire from abroad. The prevailing theory is that the British introduced it as a cheap way of feeding troops en masse and that these soldiers brought their newly acquired taste for this un-Japanese blend of pungent spices home with them. Today, curry has become a staple of the Japanese home, that’s enjoyed by people of all ages. It’s thicker and sweeter than most other curries of the world and has a depth of flavor that’s unique, thanks to an ample dose of caramelized onions. With big hunks of tender meat, carrots, and potatoes, it’s more like a hearty stew than a typical curry. 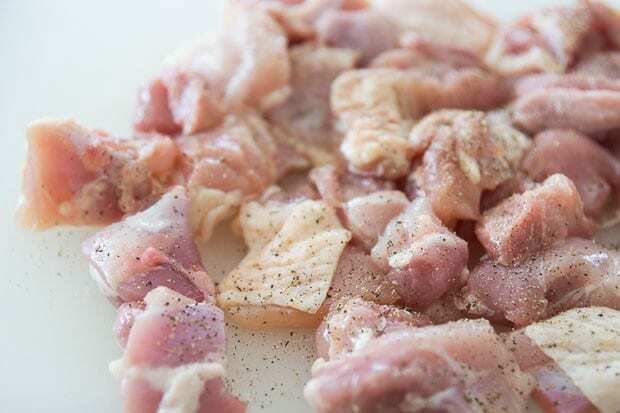 Clean any large bits of fat or tendon from the chicken and cut into large chunks. Sprinkle with 1 teaspoon of salt and 1/4 teaspoon of pepper and mix to distribute evenly. 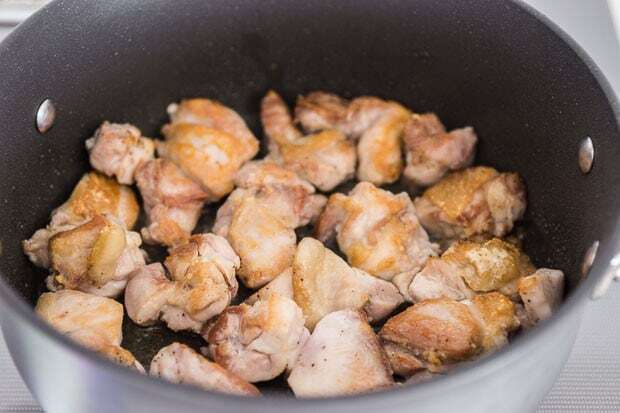 Heat the vegetable oil in a heavy bottomed pot over medium-high heat until hot and shimmering and then add the chicken in a single layer. Let the chicken brown undisturbed (about 5 minutes). Flip the chicken and let it brown on the other side. Add the grated garlic and ginger and fry in the oil until it's not sizzling as much and it reaches a rich caramel brown color. Add the onions, and stir to coat with oil. Cover with a lid and let the onions steam until translucent and limp (about 10-15 minutes). 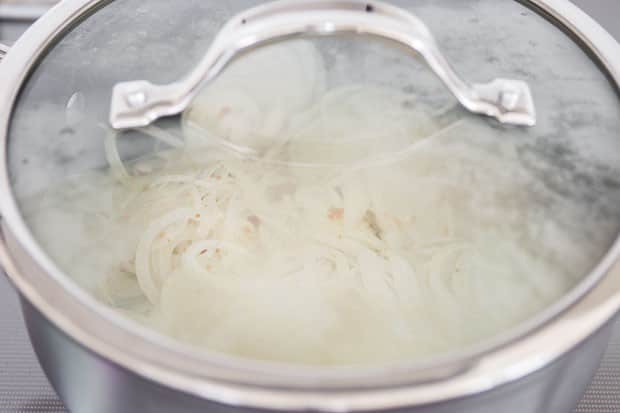 Remove the lid, turn up the heat to medium and continue frying the onion, stirring constantly until it's reduced to about 1/8 of its original volume and it forms a shiny caramel brown paste (about 20-30 minutes). If the onion starts to stick to the pan before it's fully caramelized, try scrubbing off the stuck bits with a spatula. If that doesn't work you can add just a bit of water to the areas where things are sticking and then use the spatula to scrape. When the onions are fully caramelized, add the curry powder and saute briefly until very fragrant. Return the chicken to the pot and then add the stock, carrots, grated apple, chunou sauce, tomato paste, cocoa powder, salt and the bay leaf. Bring to a boil over high heat and then reduce the heat. Cover and simmer for 15 minutes. Add the potatoes, cover and simmer until the carrots and potatoes are very tender (another 15-20 minutes). 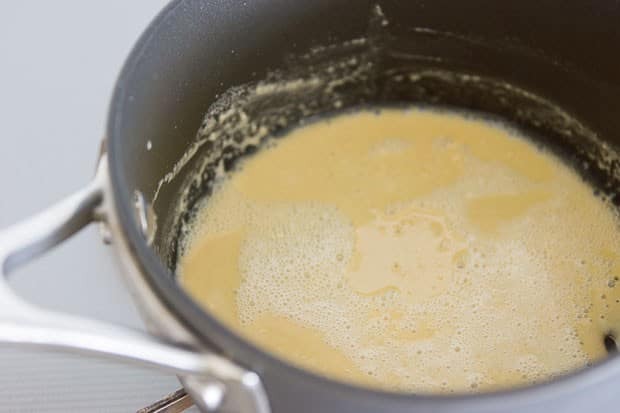 In the meantime, make the roux by adding the butter and flour to a small saucepan over medium heat. 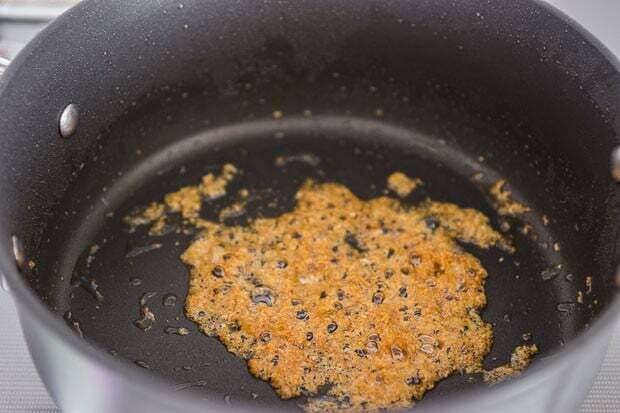 Use a spatula to stir constantly until the bubbling subsides and the roux is a light brown color. When the potatoes are tender, taste and adjust salt to taste. If you like your curry sweeter, you can add some honey. Finish the curry by stirring in the roux and green peas and bringing to a boil to thicken the sauce. Serve with hot rice, or on top of a bowl of udon. Thanks for the recipe, Marc. I’ve been wanting to make Japanese curry for the longest time now, but have been unable to find a recipe. If there are any, they’re in Japanese! I’ve been resisting the call of the packaged Glico curry pastes, and I don’t know how long I could have lasted with a family member asking for Japanese curry. Now that I think of it, Japanese (Glico) curry and frozen tonkatsu ramen are the only “packaged food” I eat. Easy meals, easy flavours. Kudos to you for going the extra mile. Great to see a recipe for this! When I was in Japan I often indulged in a “katsu curry” (I think thats right) and I do remember the sweetness associated with it. That, along with all the other wonderful foods I indulged in will always be remembered. Can’t wait to actually give this a go. Cheers Marc. I LOVE Japanese curry. Looks great! I didn’t know it was so easy to make from scratch. Could I make the curry dark brown by further cooking the roux or will the water wash the color down anyway? Wow, I bet it’s just delicious…love it. fabulous! the first time i saw curry as an option on our local Japanese restaurant menu I was like, HUH??? then i did a bit of investigating and found out exactly what you discussed here. thanks so much for the recipe. I love the packet Japanese Curry but I’ve always worried about the preservatives in it. I will definitely be trying out your fantastic looking homemade version. Haha, I get the curry udon packs from Fubonn and they’re so good! It’s like curried gravy on udon. The first time I had Japanese curry it freaked me out a little – I thought they’d mixed curry powder with cream of mushroom soup. 😛 But now I like it. I have some of the cubes, but I still tend to make it from scratch too. Japanese curry is my favorite and this looks good! This is great! I have been eating a lot of Japanese curry rice lately. 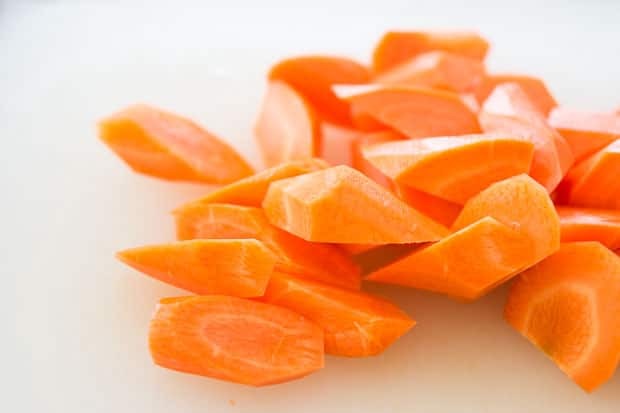 I have just been buying it take out from Yoshinoya and at home add a whole lot of cooked and raw veggies. It is not too bad. (Half fast food, half healthy garden veggies, kind of a weird combo.) So, I have been thinking that I want to get some new and yummy recipes for curry and make up a big batch and just freeze it. We’ll refer to your recipe. Thanks! I luv Japanese Curry esp mixed with tonkatsu! yummers! FANTASTIC!!! It is sitting in my family’s very happy stomachs as we speak. I am going to take a page from your book though and try a few tweaks! what is japanese curry called in japan ? I believe the origin is British rather than Indian. 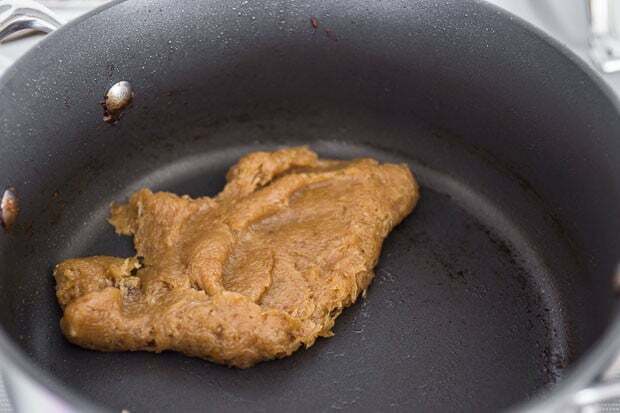 The roux technique with flour and butter is definitely European not used in Indian curries. The sauce is more of a British stew with Indian spices and was the British version of curry in the days of the Raj. i just made this and thought it was pretty close to what I have had in Japanese restaurants. The only thing I had to do different to the recipe was add extra water to get the roux to a nice gravy like consistency. Thanks! This is fantastic! I've made it twice now – sans apple and peas, and using a jumbo sweet onion – and it's just as good the next day (cooking for two people, I end up with leftovers for the week). it's just called curry, only they say it in a japanese way (: At least that is what I have heard them say. 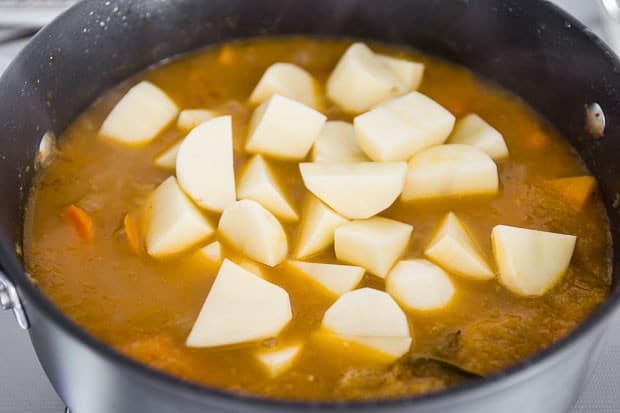 The blocks of curry may be easy, but they have unbelievable amounts of sodium, MSG, and other chemicals. They usually come in packages of 10 or 12 chunks. Each chunk is considered one serving, but a good plateful of rice smothered in curry uses at least two chunks. Two chunks puts you over the daily requirement of sodium. My blood pressure goes up considerably after eating it. That’s why I’m trying to find a good recipe with waaaay less salt. get in the curry blocks. This recipe looks great and I can’t wait to try it!! The only thing is that I’ve always used the packaged curry and never used any curry powder before.. is there any particular kind of curry powder that I should use for this recipe? I don’t like the flavor of Indian or Thai curry, and want to make sure that I get the right kind of curry powder for this Japanese curry… Also, do you know where I can buy the curry powder in New Jersey? Thanks!! thick), or any sweet elements like fruit puree. I love curry, it’s the best winter staple! But I was surprised that fuluba (fenugreek) was not among your list of spices for the roux. I guess it’s not a well known in the West, but I’ve always used it and can’t imagine a curry without it. You may want to look into it. list of the spices that go into it. 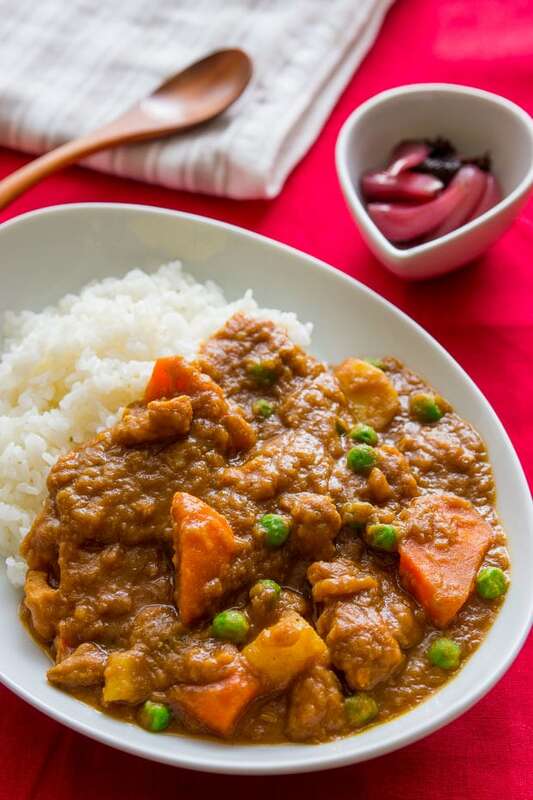 I have been looking for a Japanese curry recipe for a long time and am so glad I found this! (I almost had it figured out, but not quite.) I don’t like the boxed stuff, so high in sodium. Thank you, it is delicious! Instead of the apple, I used apple butter (about 1/4c), whose main spices are cinnamon, ginger, clove and nutmeg. It was my own homemade apple butter, but I’m sure a good farmer’s market apple butter would also work well. Can you tell me what rice and how to make the rice, Japanese style? sticky? but it’s not the same as sticky rice (used to make mochi). Thank you! Making this today! Can I use canola oil instead of butter in this recipe? I just found out I don’t like the taste of “cooked” butter… It always tastes a little sour for me..
cultured butter? Which brand do you use? I used Land O’Lakes butter. It might not be the butter, it might be me. . I didn’t grow up eating butter, so that’s probably why I think it has a “strange/sour” taste when I use it to cook food. When my mom cooked she always used a neutral flavor oil. I have to make curry for Japanese class. What do you recommend is the easiest and quickest way to make a good curry?? Buy Japanese curry bricks and dissolve them in water. They can be found at any Asian Grocery Store. This looks so good! Thanks for mentioning your curry recipe. I’m trying it very soon…can’t wait! OK, this is a great alternative to the sodium bricks sold in stores, now how about a home made alternative to tonkatsu sauce that doesn’t have all the chemical additives? Nice. Just tried this and it’s simpler than the recipe I had been using – and just as yummy! Bringing a batch to our friends from church who just had a baby. Thanks! about an hour with chicken. I love this dish, I’ve been making it for a few years now. My recipe is slightly different then yours (I’ve added mushrooms and peppers, which are great by the way, also, I’d recommend serving with green onions) I like the idea with the peas though. I might try that next time. I’ve been looking for a good recipe to make the sauce from scratch though. I’m definatly going to try this yours! Loving the sound of this recipe, I’ve been looking for this for ages, thanks. what does laddle about 2 cups of liquid into the roux mean?